Anyone know what to do with 100+ year-old caulking? It’s got to go somewhere… Maybe in this box for now. Big things afoot – or rather – atrailer, this week. Dorothy is getting ready to be moved out of Tony’s shop and into the yard for two reasons: a) the boatbuilder needs his shop back for a course beginning this Saturday, and b) the boat needs to get re-hydrated in preparation for re-caulking. Tony and Dorothy with the little 8-foot plywood pram that 4 families will be building next week. The first reason Dorothy has to move from her cozy and dry berth is that Tony’s shop will be full due to a Family Boatbuilding course, when 4 teams will each make an 8-foot Sabot pram in 4 days (sounds like a reality show!) Who knew you could build a boat in 4 days? We’re on Day 881 of restoring Dorothy (not even the entire restoration – that is just the time Tony has had her) and that’s the sum total of my (Tobi’s) experience building boats. So now we’ll see the reverse and how fast it can go! As for the reason b) for getting her out of the shop, the basic premise is this: a wooden boat that hasn’t touched water for 10 years is likely to have wood with drastically lower-than-ideal moisture levels. In Dorothy’s case, her wood moisture content is around 8%, when it should ideally be about 16-20%. If she were to be re-caulked (cotton stuffed between her planks) with her wood so dry, and then put in the water, that thirsty wood will soak up so much water her seams would clamp shut much tighter than you would wish. So Tony’s challenge is to figure out how to wet her down in his yard and re-hydrate her to the point that she can be gently re-caulked, before returning to the sea to soak up more salt water (which, if you remember your Grade 10 chemistry, is a preservative for wood and one of the reasons for the name for this documentary “Between Wood and Water”). The Grove Woodworking School, located on lovely Gabriola Island off the east coast of Vancouver Island, B.C., is a marvel of order and efficiency. 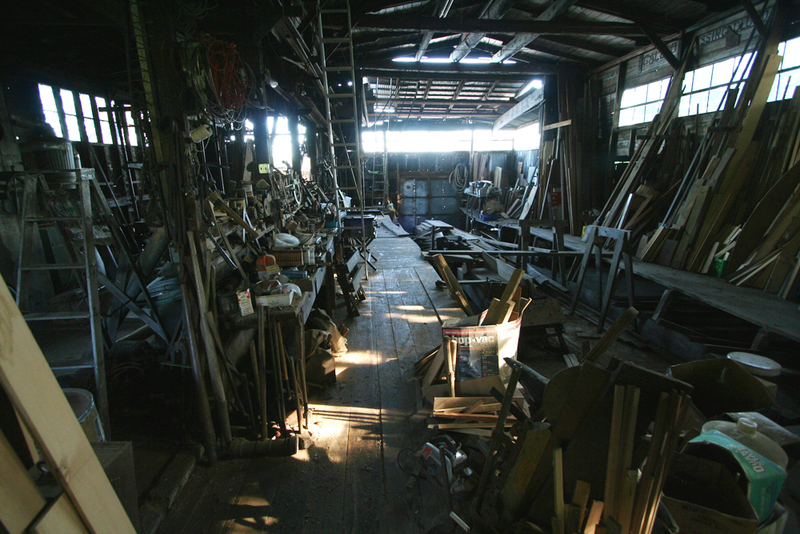 Tony Grove’s shop is beautifully organized – partly because that’s how he works, and partly because he needs every bit of space available, especially with a 30 foot sloop taking up most of the room in his shop, her bowsprit touching the bay doors, AND a painting studio up on the mezzanine. The man has worked in enough places (read: other company shops) over his 30 year career in boat building to learn what works and what doesn’t, and he knows exactly what he wants to see in his own shop. So, as I’ve learned over the past months of filming Dorothy’s restoration, when Tony works up a head of steam about efficiency, organization and putting everything in its place, I keep my mouth shut and just let it roll. In terms of steamboxes, what apparently works for Tony is a humble design, built from recycled plywood, built as small as possible – pretty much the exact opposite of complicated and expensive. What doesn’t work is a clunky, permanent structure that takes up more precious room than it needs. I had been so anticipating seeing this amazing steambox in action – picturing some long, elegant box that could fit a plank at least – that when he actually brought out his box to begin steaming some oak pieces to replace Dorothy’s forward straps, I have to admit to a little disappointment. It looked just a little too humble. Tony’s steamboxes are portable, so they can be taken apart easily and transported anywhere, and he makes them on the fly, to fit the piece of furniture or boat piece he’s working with. He makes them just large enough to fit the piece of wood he’s working with, so as to not waste a ton of energy heating up steam to fill a big box when it’s not needed. And the heating agency is … shall we say … less than imposing. The box Tony set up outside his shop for this job uses a simple electric kettle recycled from the local depot, and a piece of rubber radiator hose. Simple, efficient, economical, and it works. And it makes lunch, too! At 1.5 hours per inch of wood thickness, (Tony was steaming and bending 1.5 inch oak straps) was just the right amount of time to cook some potatoes for lunch. What does your ideal steambox – or workspace – look like? 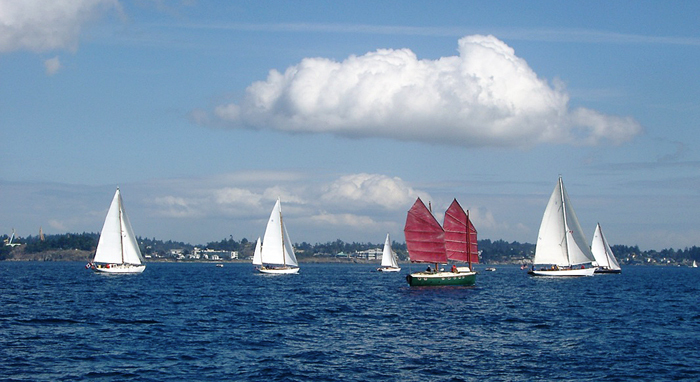 Email us a photo at dorothysails@gmail.com and we could feature it in the next newsletter. Stay in touch. We were sent some amazing photos of a wooden boat under construction in… wait for it… Corfu, Greece! Here are some of Spiros Cheimarios‘ photos of a traditional wooden boat he is building. He says he’s passionate about wooden boats (we know a bit about that infectious disease, don’t we Tony?) and likes to learn everything he can about their construction. Us too! Can any of our readers guess the type of wood being used, the vessel type and what kind of rigging it has? Answers in a post next week! And if anyone else has a project they’re working on – especially a restoration project or you’re building a type of boat with a unique history – send them to dorothysails [at] gmail [dot] com and we’ll post them here. 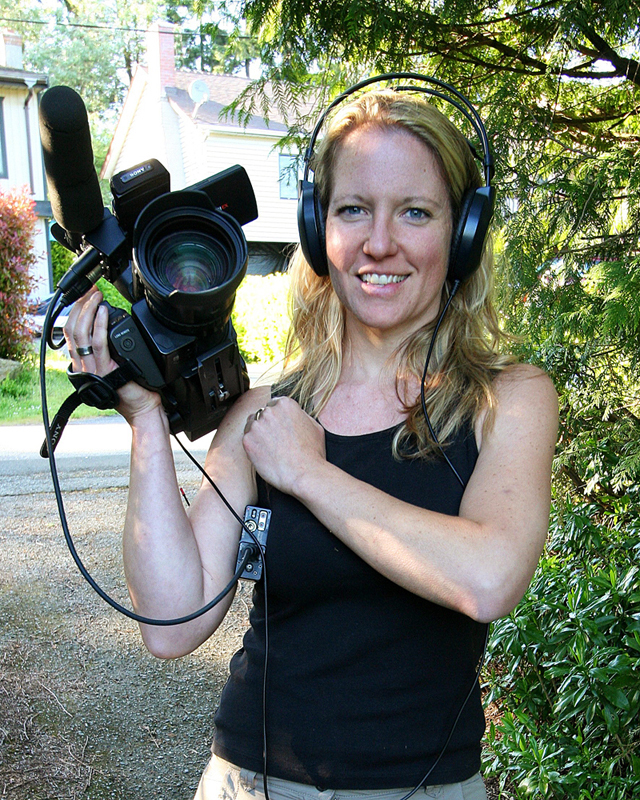 On Thursday this week, Producer Tobi Elliott grabbed camera and gear for an impromptu filming adventure as Dorothy‘s restoration expert, Tony Grove, headed to Victoria B.C. to meet master caulker Ted Knowles. 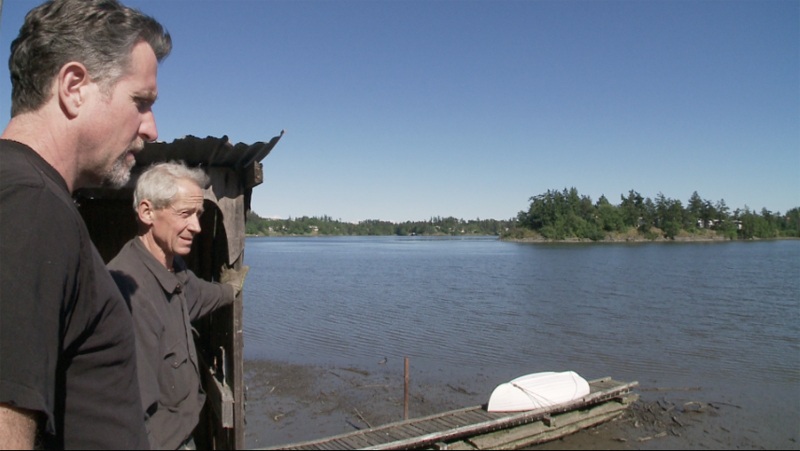 Knowles had worked with boatbuilder Brian Walker for years, eventually taking over his boatbuilding shop off the Gorge waterway in View Royal. Walker had built many of Frank Fredette’s boats, who had been in turn an apprentice to J.J. Robinson, one of Victoria’s first shipwrights and Dorothy‘s builder in 1896. Ted Knowles’ 80 year old boatshop. Photo by Tony Grove. The Walker/Knowles shop is a shipbuilding gem, having been built sometime in the 1940s, and it truly offers a fascinating glimpse into history. It’s also a bit of an anomaly since its the last remaining shop along the waterfront of that part of Victoria. There used to be a number of small boat yards on the harbour, and Ted’s is the last. More importantly, it is one of our last ties to the west coast tradition of the fisherman boatbuilder, who built and maintained his own boat in his own yard. There are a few of these guys left, but mostly they have turned to building. As with many workshops, the way these spaces are set up, designed and the tools used in them tells a story. Some might even say these spaces reveal the soul of those who worked in them. This story means that much more when the shop is almost a century old and has gone through many hands and personalities. When these shops are dismantled they reveal their hidden secrets; when they are demolished forever, that time in histroy is also erased. In this case, perhaps only this film recording will be the hard evidence of its existence, while the people who lived their lives in these spaces eventually fade along with the memories. For me I love seeing these old shops: they teach me new ideas – which are only past ideas rediscovered and developed in a different era, when things weren’t available on demand – and show me the resilience and ingenuity of the people from our not-so-distant past. Ted graciously showed us around the maze of maze of tools, large equipment, wood he’s been collecting from around the world (Mahogany, Honey Locust, Pacific Yew, Douglas Fir), generators, saws, designs, glues, varnishes and every manner of paraphenalia related to boatbuilding that he had been unearthing and organizing for months. It is a beautiful, functional space, and it was a privilege to see it before it changes hands at the end of June. After doing a good bit of exploring, Ted showed us the second gem we had come to see: a stack of beautiful 100-year old Teak from first growth Burmese forests (now Myanmar) that had been salvaged from the decks of the Union Steamship Cardena. Built in 1922, the hardworking, reliable S.S. Cardena provided marine service up and down the British Columbia coast for 35 years, bringing supplies to the resource communities up the coast, and returning to Vancouver and Prince Rupert with canned salmon for export around the world. She was decommissioned and sold for scrap in 1961, and Knowles rescued the precious teak from her decks for re-use. He felt some of the wood could be useful for Dorothy‘s restoration, because it’s the type of wood that would have been used to trim her in 1896 when she was built, and it was harvested in that era. Thanks for the reminder, Ted: using the right wood for the right purpose is probably why Dorothy has lasted so long. I’m sure it’s a principle that Tony and the Maritime Museum will adhere to in her present restoration. And thanks for the amazing tour of your historic shop. It’s one we won’t forget. So I told you last week I would reveal the “plan” I have up my sleeve for getting this doc produced. Well, ideally I would still love a broadcast partner to come on board. That’s the best case scenario because then we have a place to show the film once finished, and we could produce it under a more realistic budget. As I go to the Banff Media Festival next month, the Dorothy film will be one of the projects I bring to pitch, so it’s not out of the realm of possibility. But my other plan – because dang it! we’re going to make a film about Dorothy, aren’t we??!! – involves partnering directly to our audience to make the film. In this day and age of indie filmmaking, the practice of crowdfunding through sites like Indiegogo and Kickstarter has become immensely popular. Instead of relying on one or two big funders, we have potentially 1,000s of “little” funders who can contribute whatever they feel able towards the film. It all depends on outreach and building community, but thankfully that has become easier with the advent of social media. Some call this age the democratization of media because as slots for independent films on television become fewer, the cost of actually making films also continues to decrease. In some ways, filmmaking is actually getting a lot simpler: instead of going through 3rd party channels like expensive studios and distributors, we can partner directly with the people who want to see the film made. Producers are beginning to turn more and more to regular people to fund production in exchange for “perks” – everything from a merchandise and film-related swag, to an executive producer credit in the film. Some big studios are even catching on to this. You might have heard in the news lately about the producers of The Veronica Mars movie, who aimed to raise $2 million and instead pulled in $5.7 million. The highest proportion of backers (23,227 people) put in just $50 to get a host of swag, including a DVD of the movie with a behind-the-scenes documentary and special bonus features. Another example: Zach Braff’s recent campaign for his indie feature “Wish I was Here” garnered $2.5 million with 36,000 backers. Now, these projects both have high profile actors and a cult following, so it’s easy to see how they could be successful. But I would argue that Dorothy has an equally strong following – albeit local, and a relatively niche group – of passionate watercraft lovers who want to see her restored and celebrated as she should be. And it just takes a few of us – a few dedicated “super fans” who are willing to spread the word – to pull in a wider community of people. And before you know it, we have a collective force that can do a lot more together than a few of us can accomplish alone. My approach to filmmaking is that I don’t have all the answers, and I like to work with a community to source out the answers I don’t have. I also have only limited resources. I work hard to do a good job telling the stories that come my way and honour them with my talents and a lot of energy. But if we go the unconventional indie route, we need more than just “Tobi and Kate”. We need a whole community to make this happen. Our immediate need is to cover 3 essential shoots this summer and fall – one of which is coming up very soon in June when two of Dorothy’s previous owners (David Baker and Angus Matthews) visit her and go over her history with Tony. Another shoot will take place in Victoria as we catalogue the archives and conduct interviews with the Maritime Museum of British Columbia, as well as some interviews at the Royal Victoria Yacht Club where she was berthed for so long. And a 3rd this fall at the Victoria Classic Boat festival where we hope to capture the vibe of the classic boat community. To cover these, I plan to launch a small fundraising campaign at the Ladysmith Maritime Festival on June 8th, to run through the summer and culminate with the Victoria Classic Boat festival Aug 30/31-Sept 1. 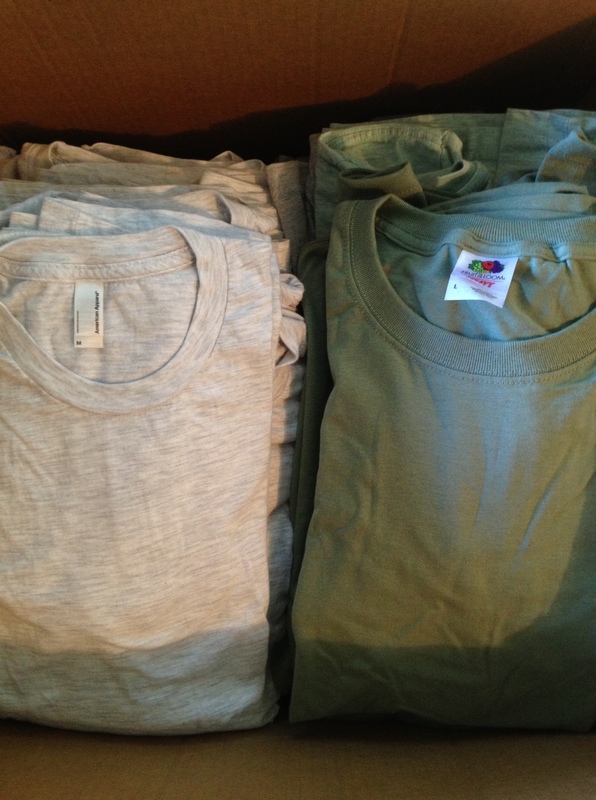 We have a few ideas up our sleeves (silkscreened “I Love the Dorothy” T-shirts, anyone?) of merch to sell as fundraisers and gifts, and we welcome all suggestions. If you are associated with a company that produces something we’d be able to resell, please get in touch. That’s all for now! Hope you’re all enjoying the beautiful west coast weather and getting out on the water as much as possible.